An FEI Endurance Championship is again at the center of controversy, with video evidence of a highly distressed gold-medal winning team horse at the Maktoum/Meydan-sponsored FEI European Young Riders in Pisa, Italy, on July 26. Spain’s CS Rogelia was deemed “fit to continue” at the final veterinary inspection following the 120km race. But this video clip, allegedly shot just moments later, shows the horse having to be supported by numerous crew and other helpers on the walk to the clinic 150 metres away. A “pass” by the vets gave CS Rogelia and Martina Codina Sala Planell seventh place individually. With two others out of the competition, Spain only had the minimum three counting scores left and eventually claimed gold – despite having two horses referred to the clinic. The ride took place in the severe heatwave afflicting Europe, though there was no reduction in speeds by the leading pack. If Spain hadn’t completed, Italy would have won gold. Only these two nations were able to finish three or more horses for a team score. Only 22 of the 49 starters completed. There are unconfirmed reports of two other horses collapsing. An FEI spokesman told Horse-Canada.com that CS Rogelia did not start showing signs of distress till 30 minutes after successfully passing the vet – though this does not correlate with the timeline advised by the person who filmed the horse. The spokesman added: “The team vet wanted to get the horse into the shade as soon as possible and the crew supported her on the walk to the clinic for veterinary assessment and treatment.” Horse-Canada.com has seen a new video which shows a horse identified as Rogelia trotting happily in a paddock next day – the head mostly obscured by a fly mask. No explanation has been offered as to why measures were not taken to reduce speed in the extreme conditions, as FEI rules allow. Instead, there was 750 tonnes of ice, extra water on the trail, an initial veterinary assessment area “right next to the vet gates,” an on-site vet clinic 150 metres away, a referral hospital two kilometres from the venue, two horse ambulances out on the track, a third horse ambulance at the veterinary assessment area, communications control center at the vet gates that allowed the organisers to immediately send assistance to horses on course, plus almost 40 military personnel and volunteers out on the track to assist at crew points. To pass the vet, horses must be deemed sound, and meet various metabolic parameters which include respiratory and hydration checks. A horse failing any element is eliminated. FEI rules used to state that if a horse required invasive treatment – which includes fluids via a drip – within two hours of finishing, he would be failed. There were regular occurrences of results being amended hours later. The FEI scrapped the two-hour rule “some years ago,” amid evidence people were delaying post-competition treatment to keep the result. Now, a horse can be treated immediately if authorised by the veterinary panel. Only if the treatment is related to elimination and considered immediate and invasive is the horse is removed from the results, and given an extended rest period of 60 days. This is the second year a FEI Young Riders endurance championship has provoked controversy. Last year, at the FEI world under 21s championship event in Valeggio, also in Italy, the winning UAE horse 8 Minute tested positive to three banned substances including steroids. A decision on that case, involving an 18-year-old rider and also his trainer, has not yet been handed down. Thirty-two of the endurance horses officially listed as Catastrophically Injured in the past five years were ridden by Juniors and Young Riders. 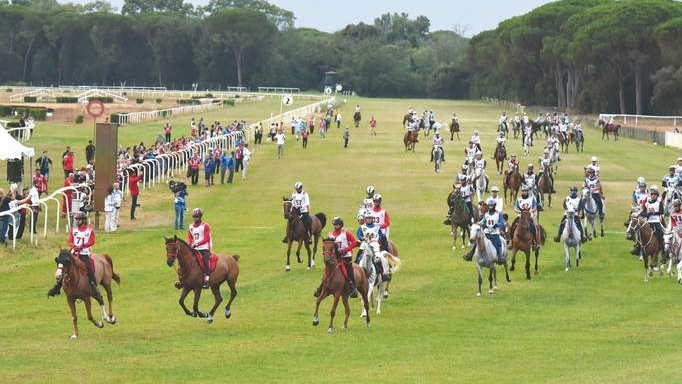 The 2018 European Young Riders Championship was bolted onto the annual Sheikh Mohammed Endurance Festival which in turn is part of an event called “Toscana Lifestyle,” whose website describes it as “the international event of sport, tourism and networking between Italy and UAE.” The FEI’s Independent Governance Advisor for was present only for the Young Riders Championship, not the second day’s rides where 2 million Euros in prize money and other “benefits” was on offer.